Dr.Dhanya Pramod is a post graduate in computer science from Pondicherry central university and completed her doctoral degree from Symbiosis International University. She has a strong academic foundation and was the First Rank holder of University at undergraduate level and Gold medalist at post graduate level. Dr.Dhanya also holds Post Graduate Diploma in Management. She has over 14 years of experience including industry, research, academics and administration. The experience with Wipro technologies R&D division gave her good exposure to research in the areas of network protocols and security. Her interest in networks, application security and aspect oriented programming further lead to award of the doctoral degree for her thesis in web application security. She has published papers in several refereed/indexed journals including SCOPUS and conferences of international repute. She is also editorial board member and reviewer of reputed journals. Currently her focus is multidisciplinary research in the areas of Management Science and Information Technology. Her passion for teaching made her to venture into academics. Her expertise includes Data Communication and networks, IT platforms and Information Security Management. She has worked with Indira Institute of Management as a faculty and entered into academic administration as HOD of computer Applications division. During her tenure at Indira Group she got good exposure to international students training, which has taken new dimensions after joining Symbiosis. She has worked as the Deputy Director of Symbiosis Centre for Information Technology prior to her current role as Director-SCIT. Dr.Dhanya believes that collaboration and team work has a great role in academia too. She has Co-authored and published case studies in IT and Management in Case Centre (ECCH) and PMI. 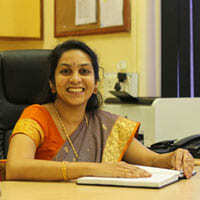 She has also received research grants from Pune University, Symbiosis International University and PMI. She was a member of PMI and her current professional association includes ISACA (Academic Advocate-Student chapter) and IACSIT Singapore (senior member).